It was a desperate time in Jerusalem. Poverty roamed the land, not caring about its next victims. The young church in Jerusalem was not exempted from this suffering. Word of their plight had reached their brothers and sisters in the churches of Rome, Macedonia, Achaia (Romans 15:26), Galatia and Corinth (1 Corinthians 16) whose loving response was to seek the advice of the apostle Paul as to how they could help their fellow believers in Jerusalem. Paul is led by the Holy Spirit to gather funds from the churches and send it to relieve the saints in the Jerusalem congregation. Paul responds to this specific collection to a question that had been posed by the church at Corinth. By beginning the paragraph with “now concerning”, Paul is referring to a question that had been posed to him in writing prior to this letter, just as he had done in chapter 7 verse 1. What we have here is an example of many congregations of saints pooling their resources to help others within the Body of Christ in a time of need. The motivation here is clear — love. This was a true “love gift”, unlike what is talked about by television evangelists. In Romans 15:26, Paul uses the word “koinonia” which has unfortunately been rendered as “contribution” in some translations, because they all saw this as an expression of fellowship with other suffering believers. What Paul had described earlier in chapter 12 was indeed the case. This event also serves as a biblical example for some things, but not for others. Here’s what I mean by that! Example number 1 – from the way Paul speaks of the first day of the week, it is obvious that this was the day on which they were already meeting. Paul does not write that they should start meeting on the first day of every week. He is, in effect, saying that they should collect this money when they have their regular meetings. Paul even mentions that this was what the churches of Galatia were doing, so this is not the day that only the Corinthian church gathered together. Non-example number 1 – That being said, this is also not an example of something — the ongoing method of supporting the local church. Think about this for a second. Why would Paul have told them to take up a collection on the first day of every week if they were already taking up collections on the first day of the week? If this were some sort of binding example, why didn’t Paul insert the phrase “from now on, on the first day of every week”? One must be careful not to take a biblical example and stretch it beyond its original intended application. The fact is, there is no prescribed method for how the funds for the local church are to be collected, or how often that is to happen! Does that mean it is wrong to take a collection on Sunday? Certainly not! With a lack of divine instruction on methods or frequency of collections, each congregation of saints is free to do was is wise and expedient for their particular situation. Want to pass the plate? Fine. Want to just have a box in the corner where saints can drop in offerings on their own? Go ahead. The error lies in taking and example of a special collection designed for a specific need with logistical planning and make it binding on every collection in every church for all time when teaching about the ongoing support for the church. Doing so is a mishandling of scripture and “going beyond what is written”. Of course we do not want to swing the pendulum too far and change what is written, like baptism by sprinkling, or communion with cake and ice cream. That being said,what we have in the New Testament on this matter is liberty to decide locally the most appropriate method for supporting the local work. 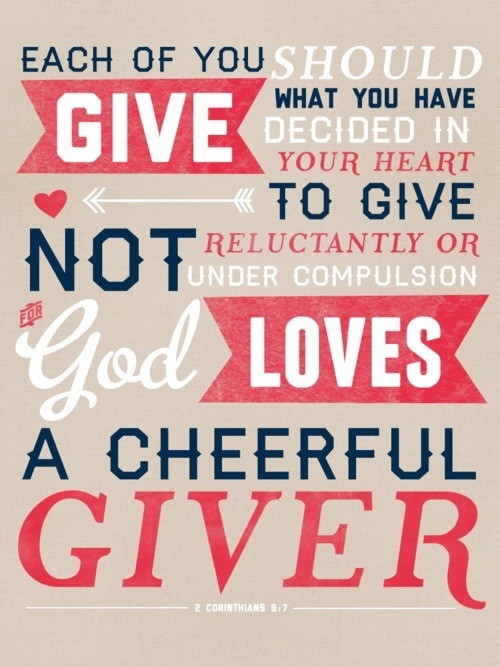 Whether that is a collection plate, a box in the back, or giving online, give with a smile and not under compulsion (i.e. tithing).